Stories of magic are are a sickle a dozen, whether it comes in the form of a letter from Hogwarts or hides through an old wardrobe. In the world of Jonathan Strange & Mr Norrell, magic has been lying low for 300 years, its practice all but lost to the shrouds of history. It returns not with a bang but with threatening whispers from gargoyles brought to life and later, a scream as the same spell is applied to a dead woman. The first episode of this BBC miniseries mostly succeeds at delivering the thoughtful, fantastically deep world of Susanna Clarke’s novel to the screen. Even better, there are hints that the show may manage to capture the humor that accompanied the darkness in the source material’s deep and detailed story of magic and hubris. Clarke’s story takes place in an alternate history where magic was once practiced but has been lost. Scholars study it, but do not perform it, just like astronomers don’t create the stars they study. Two magicians (in the theoretical sense of the word) rebel against their stuffy peers in their desire not just to study magic, but to practice it. There’s even a prophecy that two magicians will return magic to England. Could the prophecy be referring to them? No, they and the audience quickly learn. Just because you want something doesn’t make it so. It’s a theme that runs through this episode, as we meet the titular characters: Jonathan Strange, a man who desires the affections of a woman he dotes on but can’t yet win, and Mr. Norrell, whose vision of bringing magic back to the world turns out to be very different in his head than in practice. 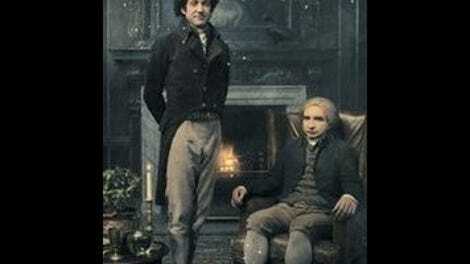 Played with unsmiling sobriety by Eddie Marsan, Mr. Norrell is a friendless scholar who prefers his old books to company, and employs a resourceful younger man, John Childermass (Enzo Cilenti), to go out into the world when he requires something that might dirty a hand. In the novel, Mr. Norrell takes what should be the fascinating subject of magic and makes it unbearably boring. And indeed, this episode shows a man who can’t bring himself to add any flash to his craft, even though he knows it would help his cause to add a pinch of panache to the proceedings. Having studied magic in books—and by hogging all the books for himself, collecting them in his vast library—Mr. Norrell is able to piece together practical magic by understanding the various tomes as a whole, connecting disparate information to create spells. His work is tedious, done in solitude, and his spells are the result of years of hard study. After demonstrating his magic, he’s ready to go out in the world and use it, mainly by helping the war effort (England is at war with Napoleon at the time). Initially rebuffed by a cabinet minister, Norrell at last shows some moxie with a bit of reverse psychology, musing aloud on how hard it would be to bring the cabinet minister’s fiancée back from the dead. Jonathan Strange thinks nothing of magic. Bertie Carvel plays Strange as an earnest man who falls just short of dashing, the type of person who cheerfully stumbles through life, charming with his wealth and likable demeanor. Strange seeks the approval of Arabella, who wishes her moneyed beau would fill his time with an occupation. Luckily for her, an occupation comes in the form of a Vinculus, a rough street magician who serves as the connection between Strange and Norrell in this episode. He has a prophecy, which foretells two magicians bringing magic back to England, plus some quickly spoken lines about a nameless slave. In London, Mr. Norrell scoffs at Vinculus’ prophecy, which supposedly comes from the Raven King, the mythical figure of magic’s past. When Strange hears it in the Yorkshire countryside, he sees an opportunity to impress Arabella, helped along by the two spells Vinculus sells him. Performing magic for Strange is as simple as drawing a circle on a mirror, which reflects not his own surroundings but peers into Mr. Norrel’s reading room, where Mr. Norrell briefly looks up like he’s sensed a disturbance in the magical force. Maybe he has. The reemergence of magic from Mr. Norrel and its discovery by Strange set into motion some grand events, beautifully shown in the form of a fairy spirit who emerges when Mr. Norrell tries to revive the dead women and hinted at in a fantastically directed scene that see’s Mr. Norrell’s manservant, Childermass, interact with Vinculus. It doesn’t take a Merlin to see that these characters are unleashing a force onto the world that has slept for 300 years that they don’t really understand, no matter how many books they read or what natural talent they have. This is magic that comes with scary consequences, the dark nature of which the magicians will clearly have to grapple with in future episodes. Magic has its own agenda, personified in the fairy that extracts a horrifying promise from Mr. Norrell in order to work his magic. The characters have yet to meet, and it’s hard to imagine seven episodes being sufficient to tell the story of their years-spanning relationship. Clarke built a richly detailed world in her novel, crafting an enormous, comprehensive parallel universe complete with magical additions and a footnote count that reaches nearly 200. The book reads like the best humor of Dickens and the slyest observations from Austen, set in a comically mundane version of Victorian England. It’s a story of the eponymous characters, but Clarke uses their foray into magic to ruminate on history, human nature, and what it means to be British. The BBC’s first episode demonstrates it can pull off the story, but that doesn’t necessarily mean it’ll pull off the magic. Mr. Norrell smelling the book is a pitch-perfect little detail. The scene of the Vinculus’ finger smudge turning into a raven with each flipped card demonstrates the power of action without anything flying, shooting, or getting overly emotional. It bodes well. The library is enough to make a bibliophile go mad. Commenters who have read the book: Let’s all do our part not to spoil this fantastic story for those experiencing it for the first time.